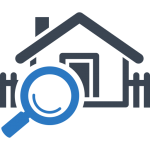 Before deciding on purchasing a home, it is advised to have those cracks checked by an experienced home inspector in Winston Salem. In addition to noting the presence of cracks in the home inspection report, the home inspector will be able to let you know if they are merely cosmetic concerns or red flags of more costly damage. On the other hand, stress cracks may be an indication that structural movement has occurred. If larger than ¼ inch in width, running diagonally across a wall (often originating in corners of wall openings), and tapered from large to small, wall cracks take on a heightened sense of urgency to a home inspector in Winston Salem. If these internal stress cracks are accompanied by external cracks in the same area, this will call for further evaluation of the home’s foundation. Other tests, such as checking for sticking bathroom and bedroom doors and measuring to determine if floor joists are sagging, can help the home inspector in Winston Salem gauge the seriousness of a situation. Home Inspector Tip: Examine the area around a drywall crack. If you see nail or screw heads which have popped out of their wood studs, this may be an indication of structural movement.